I went to Michael's and found some Washi Tape in the scrapbooking section. It is just a roll of tape that has cute prints on it! It can peel off, and re-stick, so it is easy to work with! I decided to use the Washi Tape on my student sticks! I wrapped one end of the popsicle stick in the Washi Tape. Then I wrote the student numbers on the sticks. 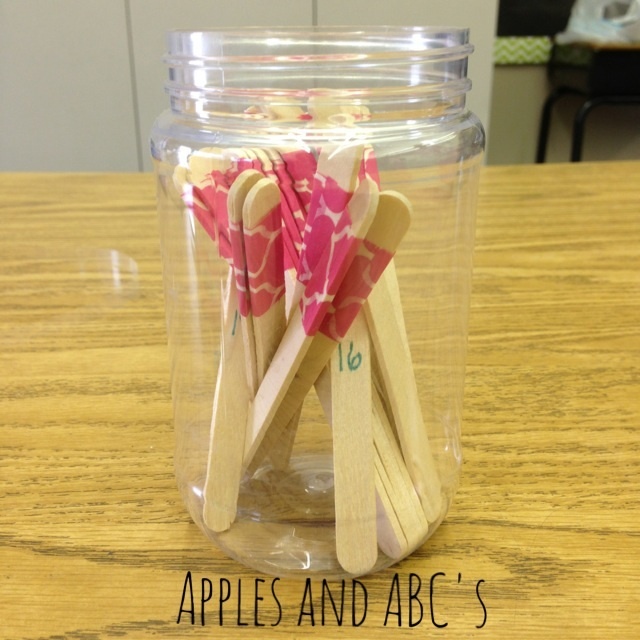 How this works is, I will place all of the sticks in the jar, Washi Tape facing up. I will pull out a sick and read the number. That child will either answer the question, or it will be their turn. Once their turn is over, I will place the stick back in the jar, WASHI SIDE DOWN. That way, I will know that the student has already had a turn. Once everyone's stick is Washi side down, I will flip all of the sticks over, and start again! Fair and square? I think so! In years past, I have done this same thing, but painted both ends of the stick different colors. But then you have to wait for them to dry (and I make a mess). I was going to do the other end of the stick a different color Washi Tape...but why? This saves money and time, and still looks cute! I just bought two rolls and had no idea what I was going to do with it. Now I do!! Thanks so much! What a simple but fantastic idea! Look at you...lovin' those mad Washi tape skills...pretty dang cute! Awesome idea.. I love that it's simple. You have no idea how much time I wasted PAINTING and MOD PODGING tongue depressors and clothespins the past three weeks!!!! I wish I was as smart as you!! I"m SOOOO doing this next time! THANK YOU!!! Such a great idea! I have been using clothespins for years and had to remake them each year because I put the students' names on them. This is so much easier and I can use year after year. Thanks so much. Wow!! You are a genius!! I am back in school working on my second bachelors right now to become an elementary teacher! I met my dream guy and wanted to graduate the first time in a hurry... then we had our sweet little baby!! Anyway, I will be pinning ALLLLLL of you amazing ideas!! Thanks for the "pinspiration"!